I am a bit of a hoarder. I’m definitely a food hoarder, but also a hoarder of things. My husband thinks it is junk. Which it isn’t! But seriously, I keep things in boxes that I have never looked at for the past four years that we have lived here. I find myself holding on to things because… “don’t you dare get rid of it because I am saving that chair just in case some day I want to paint it red and have a tea party”. Yes…that really came out of my mouth. It was a similar feeling for me when I made the switch a year ago to give up gluten. Making the switch to being gluten free can be tough sometimes. It’s hard to not feel like an outsider when everyone is laughing and enjoying cake and big plates of lasagna. Family gatherings and cookouts and office parties offer a plethora of pasta salads and cupcakes and brownies and bread and crackers. I would end up being the person in the corner snacking on carrots and a bag of nuts that I had stashed away in my purse like a squirrel. BECAUSE I AM A HOARDER. One day I decided to PURGE! I threw away everything that contained wheat or even traces of wheat. It felt awesome. I began researching and arming myself with easy recipes to bring to gatherings. So now I always offer to bring something that I know that I can eat and that will blow the socks off of others that have no idea how great gluten free food can be. This recipe uses nut butter in place of flour! No flour, no oil, no butter. Basically it is just almond butter and bananas and honey and eggs. Those purged cabinets probably have these simple ingredients in them. 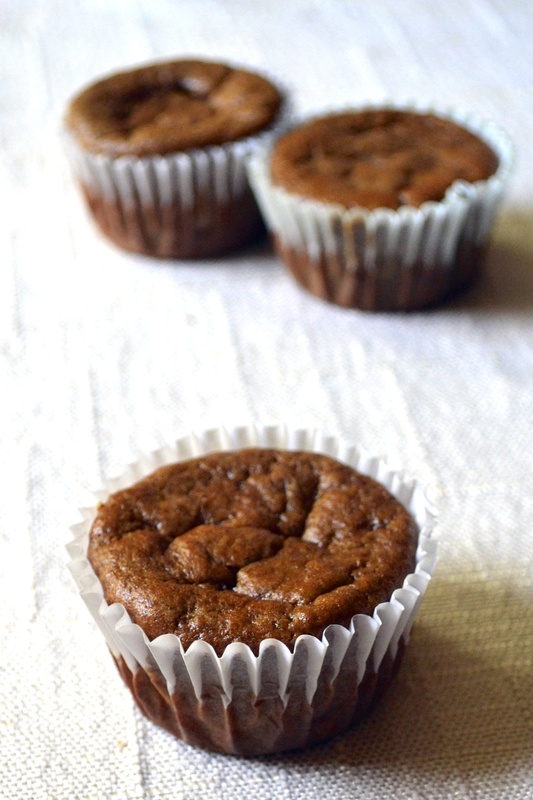 These muffins are rediculously good and rediculously easy! 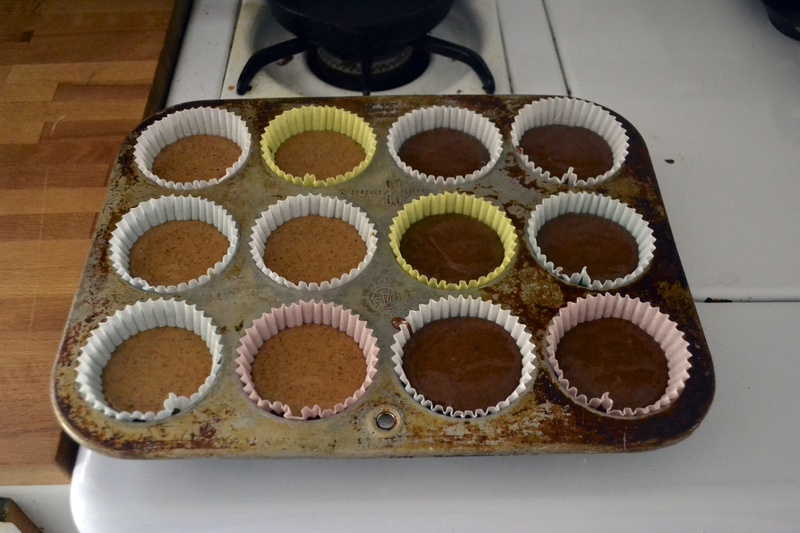 I have made them with almond butter and also with peanut butter. Both are fabulous. 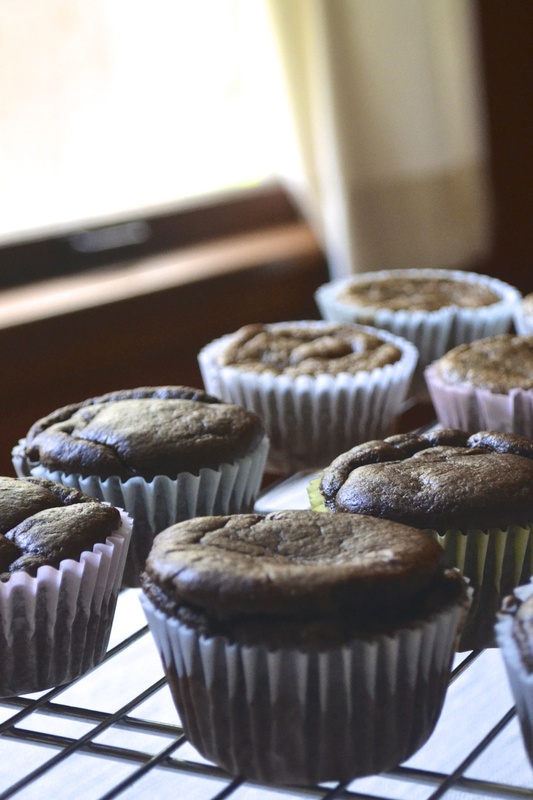 You can also add cocoa powder to the batter for chocolate cupcakes! Preheat oven to 350 F. Prepare a 12 cup muffin tin with muffin liners. Set aside. 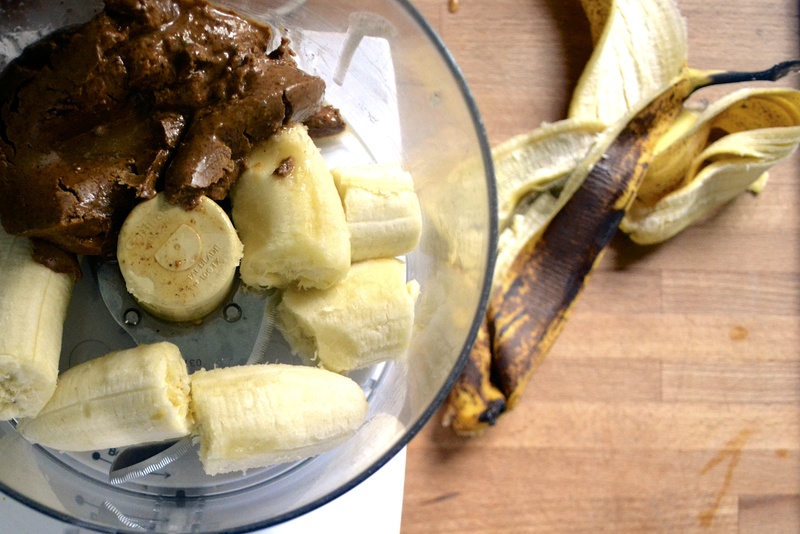 In a medium bowl, combine the banana, eggs, and almond butter until well mixed. Add the remaining ingredients except the cocoa powder. With half of the batter, fill 6 muffin liners 3/4 full. I use a 1/4 cup to measure for each. With the remaining muffin batter, add the cocoa powder. Fill the remaining 6 muffin cups to 3/4 full with the chocolate batter. Bake for 15 minutes at 350F. Muffins will be firm a slightly golden, but fluffy. Allow to cool for 10 minutes then remove from the muffin pan to a wire rack. I have also made these with peanut butter and they were great. I assume other nut butters would work too. If you have a nut allergy, sunbutter (sunflower seed butter) would be a good substitute. I recommend all natural and unsweetened nut butters. However, if you aren’t using all natural nut butters (that is, if they have added sweeteners) then lower the overall amount of added honey in the recipe. These are also delicious as cupcakes!